Runde's Room: You ARE Appreciated! Happy Teacher Appreciation Week! And just so you know, I'm totally adopting this week for us Canadians, too. Has anyone told you today how absolutely amazing you are? As a colleague, a blogger, a pinterest stalker, and a mom of three young ones in school, I am constantly inspired and awed by all you do. The hours of preparation, endless marking, coaching, mentoring, encouraging, engaging, teaching, helping, listening, sharing, soothing, and loving of children is evident ... every.single.day. I'm combining efforts with some of the best upper elementary bloggers and educators out there to show you a little appreciation. We've packed a little goodie bag full of appreciation just for you as our little way of thanking you for everything you do. These items from our TPT stores will be FREE all day Tuesday, May 7th - Wednesday, May 8th. Just visit our stores on one of those days to download your gift from us. 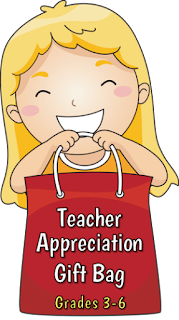 TPT is holding a site-wide teacher appreciation sale on those two days, as well. All our items at our stores will be on sale for 20% off, and you can get an addiditional 10% off at the checkout by using the code TAD13. How's that for a little appreciation?? Do you want a peek inside our Teacher Appreciation Gift Bag? Rachel (a.k.a. The Queen of Task Cards), from Minds in Bloom, has offered her Vocabulary Task Cards. My class LOVES using Rachel's task cards, and these ones are perfect for our spelling/vocabulary program. This resource contains 35 different task cards that can be used with any word list. I can use 4 - 5 in a center activity during our word work with our spelling list, and switch them out every week to keep the learning fresh and fun. Rachel's TPT Store is full of task cards and resources that are common core aligned and perfect for language and math centers, or test prep. If you're a faithful follower of mine, you already know how much I love Stephanie from Teaching in Room 6. Stephanie is sharing her Time for Math: Math Clock Creativity. This activity is perfect for differentiated teaching and learning, as each student has the opportunity to showcase what they know. It makes a great diagnostic activity to find the starting point of what your students already know, or great summative activity to measure what they learned. What's more, it makes a wonderful bulletin board display! Stephanie's TPT Store is full of resources and activities that keep your students practicing the skills they need to master in a way that can be displayed and celebrated! Laura is the creator of Laura Candler's Teaching Resources, and is the first blogger I ever followed. I thought I died and went to heaven the day I discovered her File Cabinet full of resources. Laura is giving away her Sentence Go Round resource that was the perfect fit for my students this week, as we were reviewing how to make more interesting and complex sentences. All of Laura's resources contain clear teacher directions and all the materials you and your students will need for the lesson. She is also the author of a few of my favourite books on my teacher bookshelf: Graphic Organizers for Reading, and Power Reading Workshop. Check out Laura's TPT Store for these and many other invaluable resources for your classroom. Lastly, I'm giving away my End of the Year Drama Circle. This activity is great for collaborative learning and listening skills, and makes the perfect after-testing or end of the year activity. Don't forget to come back on Tuesday or Wednesday to download all these goodies, and remember - all of our products will be on sale during the Teacher Appreciation Sale as our little way of saying thank-you! 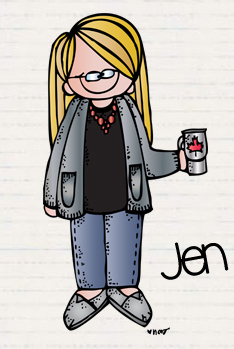 This is awesome Jen! Thank you very much! 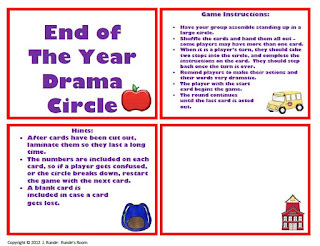 I just bought your End-of-year Drama Circle because my students had SO much fun with the Fairy Tale one. Each class asked to do it twice, so that they could "perform" a little better the second time around. What fun! When I told them you had more to choose from, they begged me to get some more. I don't know where you came up with the idea, but it's a ton of fun! Happy Teacher Appreciation right back at ya! I didn't realize you were Canadian! Me, too. I live in Victoria. This is very generous of all of you! Thank you for sharing it with us! This is so generous of you ladies! Thank you!! Thank you so much for sharing! What wonderful and creative ideas! Am loving your blog and your creativity. Thanks for sharing both!